The Tuesday 12: 12 Amazing Art Projects Your Students Will Love! - Teaching Rocks! The Tuesday 12: 12 Amazing Art Projects Your Students Will Love! In this week’s edition of The Tuesday 12, we’ve rounded up 12 art projects that are not only beautiful, but students will absolutely love working on them! Click on each image to be brought to the source. 2. 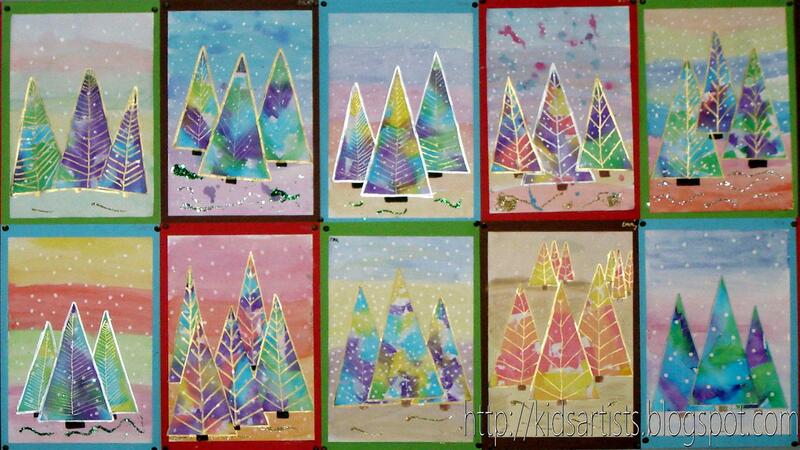 Colourful Christmas Trees: Watercolour paint is used for the background; however, colour transfer from tissue paper is used to create the beautiful trees in the foreground. The link has the complete instructions. I can’t wait to try this because the student artwork looks so beautiful grouped together! 3. 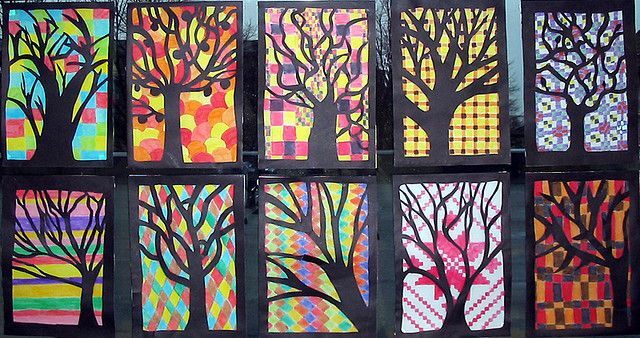 Colourful Silhouettes: This art project combines both silhouette and mosaic art, as students are traced onto cardboard, painted black, and then covered in circles cut out of marbled paper to create a beautiful mosaic. 4. Sculptural Paper Relief: Students created these beautiful, three-dimensional works of art by cutting, bending, rolling, folding, and then gluing paper onto the backgrounds. 5. 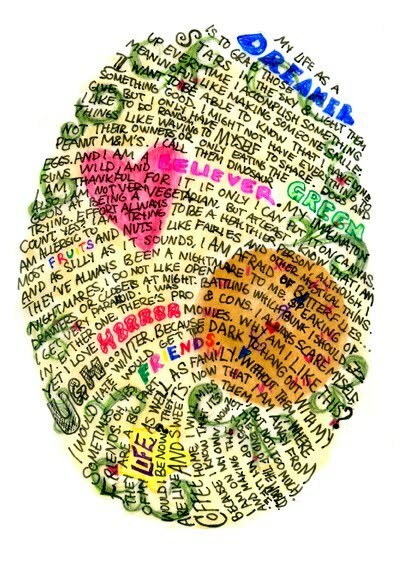 Personality through Fingerprints: This would be a great activity for the beginning of the school year for students to learn more about one another and discover what makes each person unique. Student fingerprints are photocopied and enlarged. Students then follow the swirls of their prints and add in their interests, thoughts, ambitions, goals, and personality traits. 6. Versatile Trees: I’ve done this type of activity with crosses for Lent, but I like the idea of using a bare tree as well. The tree is cut out of darker paper and different art media can be used to colour the inner areas (e.g. oil pastels, chalk pastels, water colours). Students can focus on warm colours, cool colours, monochromatic colours, or any combination of their choice. 8. Paper Dart Collage: I’m always looking for ideas to make three-dimensional art projects. I find that many 3-D art is very time consuming and requires quite a bit of skill. I like these types of art assignments where the materials are easy to obtain (paper) and uses a simple, repetitive technique, so that students have time to focus on the composition and colour scheme. 9. 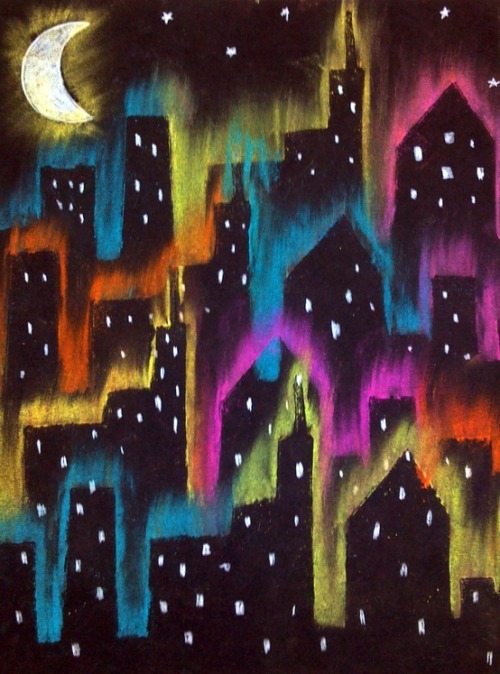 Chalk Cityscape: You really can’t go wrong with bright, blended chalk pastel on black construction paper. I love how the buildings and moon glow. Cut out the buildings on separate paper, place it on the black construction paper, and use the chalk pastels to shade around the buildings. Once you remove the buildings, you’ll be left with this glowing outline. 10. A Study in Line: Students trace their hands and then use a variety of lines to fill in the background, and then coloured patterns to fill in their hands. 11. 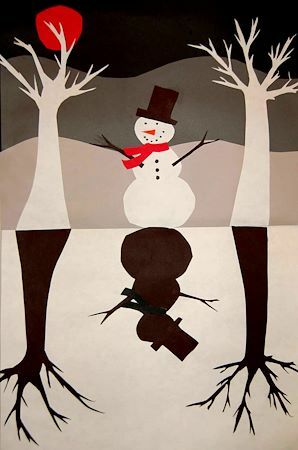 Positive/Negative Art: This is such a great idea…students create a scene (I like the winter scene, but this could be done with almost anything really! ), and then recreate it in the bottom half using just the shadows. Do you have more information on the paper dart? I would love to know for my 4th or 5th graders! Thanks so much! We updated the paper dart link, as the previous one did not work anymore. We hope you like the new one! It includes instructions to complete the project. I am wondering if you could re-post the link for the directions for the paper dart collage. I see you re-posted it a year ago and it seems to not be working again. I would love to do this project with my fourth graders! I don’t see the updated link for the paper darts. Can you please tell me where it is Posted?